Caryl's Blues Cracker sold for 4,500gn. Scottish breeders were out in force at the Northern Supreme Sale of Blue Texels in Carlisle. 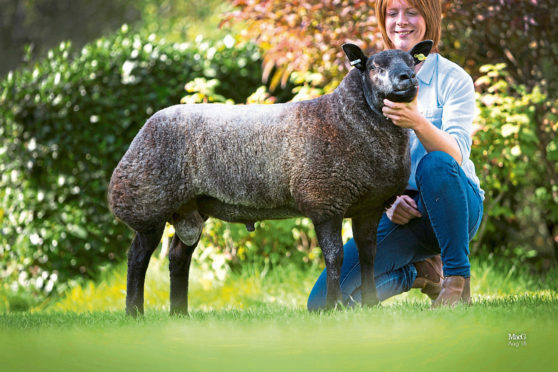 A top price of 4,500gn was paid for a February-born ram lamb from Welsh breeder Caryl Howells. Caryl’s Blues Cracker is an ET son of imported sire Beili Blues Peter, and out of an imported dam. He sold to Messrs Lyle for their Viewforth flock at Nether Pratis Farm, Leven, Fife. The Lyle family recouped some of their spend when they sold three-year-old ram Millend Yeehaa for 1,000gn. By Hackney X-Rated and out of a Millend dam, he sold to Messrs Morris & Co, Welshpool, Powys. Next best in the male section at 3,200gn was February-born ram lamb Tap O Noth Cassanova from Deborah Atkinson, The Manse, Duncanston, Insch. This lamb, which stood reserve champion at the Royal Highland Show in June, is by Xana Black Magic and out of a Beili Bleus dam. He sold to Staffordshire breeder Andrew Froggatt for his Sams flock. Other leading prices included 1,600gn for a February-born ram lamb, by a Beili Blues sire, from William Linton’s Falklands flock at Thurstane Cottage, Abington, Biggar. He sold in a two-way split to the Irvine family at Braehead, Drummuir, Keith, and Neil and Stuart Barclay at South Road, Insch. North-east breeder Stasa Moyse, who runs the Saltire flock at Woolhillock, Skene, sold to a top of 1,400gn with shearling ram Saltire Blue Buddy. By Hackney Your Joking, and out of an imported Hackney dam, he sold to Messrs Troup, Inverurie. Neil and Stuart Barclay achieved 1,000gn selling a February-born ram lamb, by Saltire Blue Yogi, to Messrs Alexander, Galston, Ayrshire. Meanwhile, females sold to a top of 3,500gn for January-born ewe lamb Hackney Crusader, which is an ET daughter of Joe’s Alvin, out of Hackney Yikes. Put forward by Shropshire breeders Christine Williams and Paul Tippetts, she sold to Messrs Colville, Crawfordsburn, Northern Ireland. Other leading female prices included 1,400gn for a gimmer by Hackney Yankee from Andrew Froggatt’s Sams flock. She sold to Deborah Atkinson. The sale averages were: aged ram, one, £1,050; shearling rams, 28, £816.38; ram lambs, 37, £919.03; aged ewes, two, £892.50; shearling gimmers, 52, £744.89; ewe lambs, 23, £682.73.